What the major news outlets failed to highlight yesterday in Nokia’s news to consolidate on QT for both Symbian and MeeGo is that Nokia sells a large majority share of MIDP JavaME devices deployed worldwide. And usually consolidation moves like this ripple through the Mobile OEMs. True, not many other OEMs have something like the QT strategy in-house. But you have to wonder when the next market leader in deployed MIDP JavaME devices will consolidate and drop JavaME. I wonder how Oracle will spin this? which surpasses the iphone daily activation rates bragged by Apple. But what does this mean? currently at about 80 million devices per quarter.But market share wise Apple has about 300 to 400 million device customers while Nokia has about 1 billion device customers. The key will bethe Market changes that are happening now and in the 4th quarter of 2010 and the feature set of upcoming Android 3.0(Gingerbread). Let me explain. To decrease someone’s market share the activiation rates have to at some point double per quarter. Other-wise the increase is just eating away a few percentage points of the full number of devices in consumer hands. in one year to decarese Apple’s market share by half and Nokia’s by about 25%. put new features in hands of Hardware OEMs at a fast iterations required for the consumer smartphone sector. price to $50 for an Android 1 GHZ device. Google CEO announced in talks to the press that Android just reaqched the milestone of 200,000 activations per day which surpasses the iphone daily activation rates bragged by Apple. But what does this mean? Lets put this in perspective. That is 6 million devices per month or 18 million devices per quarter. Nokia iscurrently at about 80 million devices per quarter. But market share wise Apple has about 300 to 400 million device customers while Nokia has about 1 billion devicecustomers. The key will bethe Market changes that are happening now and in the 4th quarter of 2010 and the feature set of upcoming Android 3.0(Gingerbread). Let me explain. To decrease someone’s market share the activiation rates have to at some point double per quarter.Other-wise the increase is just eating away a few percentage points of the full number of devices in consumer hands.Out another way if we reach 400,000 Android Device Activations daily activiations before Jan 1st 2011 that is enoughin one year to decarese Apple’s market share by half and Nokia’s by about 25%. That is a strong confirmation that the often-strange way of having OHA partners work on a valued-closed-behind-the-scenesnext android release trunk source at break-neck speeds along with Google Engineers is working as an effective way toput new features in hands of Hardware OEMs at a fast iterations required for the consumer smartphone sector. But, this only half the story as both hardware OEMs and software OEMs(that are members of OHA) have also made somecritical iterations. We have improvements of the MediaCore(OpenCore) at a rapid pace. We also have at the sametime SoC OEMs who are members of OHA making it possible to obtain their low cost SoC solutions and build a1 GHZ $100-priced android device. In the next 6 months you will see another iteration dropping that consumerprice to $50 for an Android 1 GHZ device. That is a fully working custom set-up with text color changes, etc. 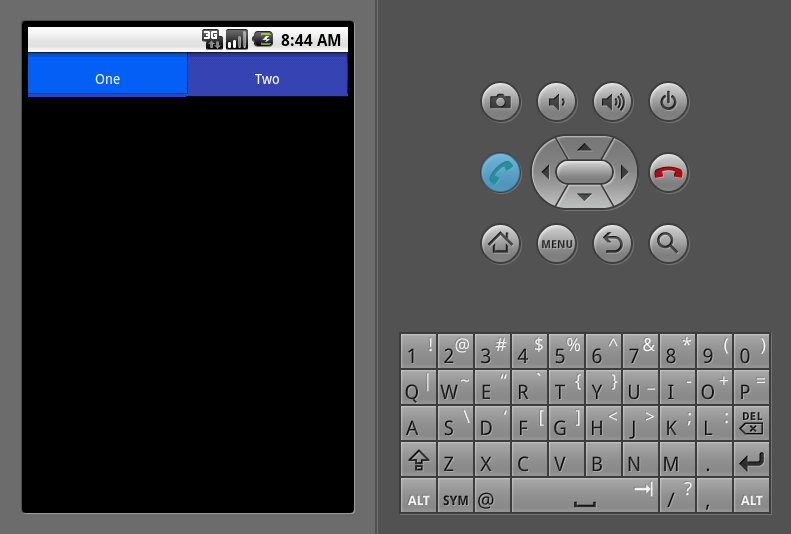 Basically, I used the concept that since its a view group(TabWidget) I can manipulate the child elements. If it was just a plain view than you still can grab the object and manipulate. Why is this important? With iPhone you are limited to the application UI guidelines that Mr Steve jobs wants you to follow. On Android you are not and thus use the look and feel of the application to establish your brand.